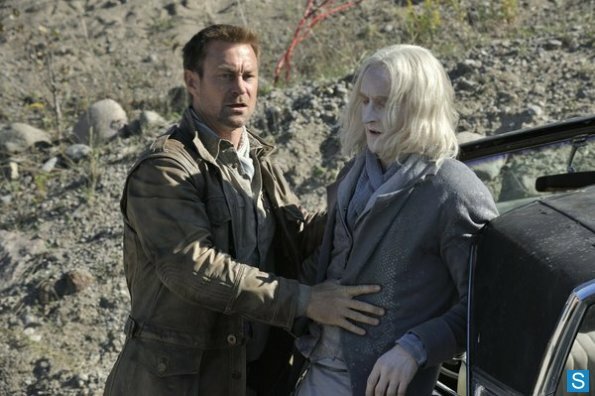 This week’s episode of Defiance, “Brothers in Arms,” was written by Todd Slavkin and Darren Swimmer and directed by Andy Wolk. 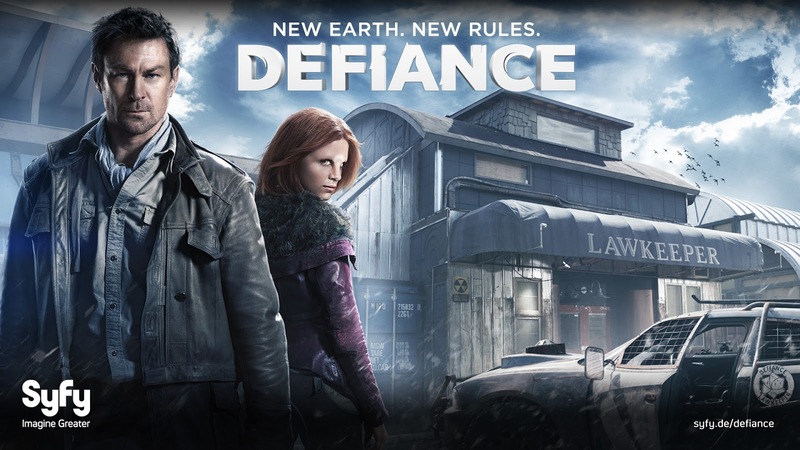 This episode did a good job of fleshing out more of Nolan (Grant Bowler) and Irisa’s (Stephanie Leonidas) past in particular and the world of Defiance in the post-apocalyptic world in general. The show pretty consistently excels at teasing out exposition without feeling like they’re doing it, which is not an easy task. One of the on-going story threads is what exactly is the artifact that Quentin (Justin Rain) and Rafe (Graham Greene) found among Luke’s (Wesley French) things. It’s obviously tied to the past as Quentin’s “digging” into the past has uncovered. If it was buried during the 1811 earthquake, that would indicate that aliens were on earth a lot longer than the Pale Wars. Perhaps scouting for the Votans? 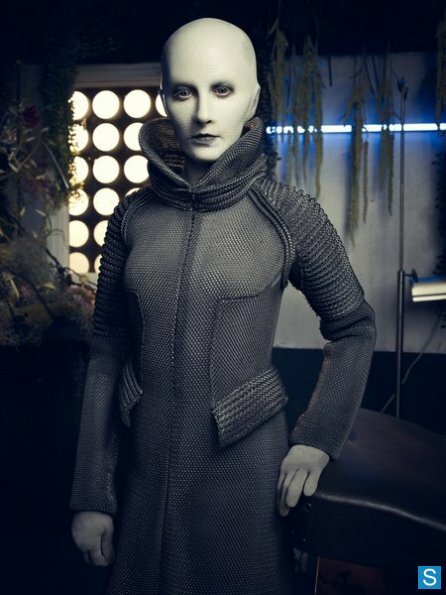 Or is this yet a different alien race who may post a threat to Votans and humas alike? I’m not completely sold on Luke appearing to Quentin. Is this a factor of Quentin’s psyche/guilt over his brother’s death or an effect of the artifact? It would seem to be a function of the artifact protecting itself. Fionnula Flanagan gives her usual wonderful performance as Nicky. She’s gone from the nurturing matriarch to scary, schemer seamlessly. 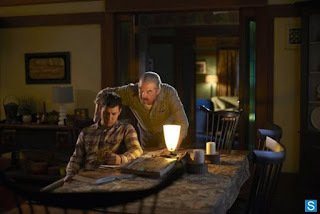 Rafe warns Quentin that Nicky is dangerous, and reminds him that Luke was killed with the artifact on him and that it endangers their whole family because it links them all to the Volge attack. Rafe clearly has a realistic sense of the power politics at play, and I wonder going forward if the Tarrs are going to have a really difficult time getting rid of him as they plan to do. I was sad to see the death of Mr. Birch (Steven McCarthy), however. I wonder who will show up to scheme with Nicky now – and if she’ll retaliate against the McCawleys or Quentin. This could set up an interesting dynamic going forward if the McCawleys have come under the protection of the Tarrs through the marriage of Alak (Jesse Rath) and Christie (Nicole Munoz). Speaking of whom – did anyone else miss Alak’s radio station this week? I was really hoping that would become a more integral motif. There doesn’t seem to be any progress in the relationship of the other young couple on the show: Tommy (Dewshane Williams) and Irisa. Tommy is quickly becoming one of my favorite characters, and I love watching the subtle touches Leonidas brings to Irisa. Tommy schooling her on the niceties of responding to an invitation is a great scene. It does make me wonder a bit about Nolan’s upbringing. Obviously, she grew up in a rough and tumble world, but I wonder if he didn’t also safeguard some of her heritage by not making her adhere too closely to human mores. I also loved the scene in the bar when she is first re-introduced to Uncle Eddie (Rob Stewart). She pulls away and then physically removes herself to watch warily from across the bar. Her watching over Nolan as he sleeps is also an animal-like response. Interestingly her “instincts” let her see that Eddie may not be who Nolan thinks he is – at least not entirely. They give her greater insight into his motivations. Her reactions are consistent in an other-worldly, alien kind of way, yet her “alien-ness” is still quite different from that we see in the other races, like the Castithans and Indogene which are also both showcased in this episode. We get some insight into the Pale Wars when Pol Madis (Daniel Kash) suggests that he recognizes Doc Yewll (Trenna Keating). Madis was the weapons designer and he implies that Yewll may have been his biological equivalent. Madis refers to some mysterious Biotyne Project and insists that Yewll was the head of it. Keating is brilliant at being able to emote fear in that scene and irritation when Eddie and Nolan come to interrogate her while wearing such extensive makeup. I’m looking forward to more of Yewll’s backstory. The “Pilot” intimated that there were things in her past that she was ashamed of, and I assume this is it. I will say that the makeup in this episode was a bit sub-par. Yewll’s makeup seemed a bit smeared in the prison scene and Madis’s was smeared or rubbed off in several – obviously there is going to be a learning curve to see what works, but I’m surprised it wasn’t caught and fixed in post, especially considering the lag time between shooting, post, and broadcast. 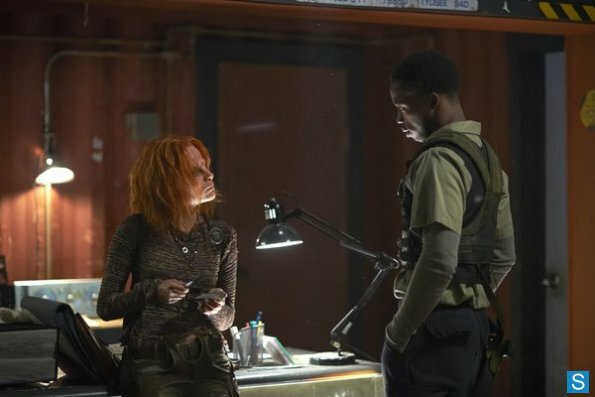 Madis proves to be as good a judge of character as Irisa when he goes to Datak Tarr (Tony Curran). He recognizes that Tarr is loyal to the community that can offer him the greatest status – something he will never get among the Castithans as he will always be of the lower caste to them. It’s going to create an interesting dynamic going forward. It seems that Stahma (Jaime Murray) is on board for Datak’s social climbing in Defiance, but will she ever long for more status among her own kind? We learn about the Voltanis Collective that is based in Brazil and seems to be the underground resistance of the Voltans. So, when Voltans want to get away from the squalor of the world, they go to Brazil and humans go to Antarctica. I loved that Nolan knew something was wrong at Datak's house because Datak was too nice to him. As always Curran is a joy to watch whether he’s being the bad guy or being tortured into helping the badder guy. Having Yewll have to get the nanotab out of him in a not so pleasant way was a nice comic touch as well. The episode also introduces Connor Lang (Gale Harold) who is a political climber for the Earth Republic who also seems to share a past with Amanda (Julie Benz). We also learn about Kenya’s (Mia Kirshner) former lover, Hunter. Neither sister seems to do well in the relationship department, but Amanda receives some mysterious flowers at the end of the episode, which would seem to have potentially come from Lang. I suspect that if he does become a love interest for Amanda it will end badly with him simply furthering his own political agenda through his relationship with her. Interestingly, Kenya torpedoes her own relationship with Nolan. He tries to step aside to allow her to do her job as she insisted he should, but then seemingly gets angry that he doesn’t try to stop her from sleeping with his friend. I’m really hoping we aren’t going to see the same illogical, mixed signals from the women on the show as we see on virtually every other show on television – I continually hope for a more emancipated group of women to appear: those who are strong enough to recognise what they want and aren’t afraid to ask for it. The main plot centers around Eddie – the friend from Nolan’s past who calls him NoMan. Eddie keeps telling Nolan exactly what he knows Nolan wants to hear. From initially telling Nolan that Madis is just some pyro, right up until Madis reveals to Nolan that the E-Republic is offering him a deal to work for them and he won’t be executed for war crimes, Eddie keeps spinning the truth. Irisa is right not to trust Eddie, but in the end, he remains loyal to Nolan. The last scene is really pretty unbelievable. It makes sense that Eddie would harbor a lot of resentment towards Nolan – he spent six years in prison for him after all. Nolan got to be a father and be free. For Eddie not only not to turn Nolan in for the reward – and how does no one else know about this bounty? – but to turn himself in for more jail time at the seeming drop of a hat is just not believable at all. It was a very weak ending to what was a really interesting episode up until that point. Granted, Eddie did have an escape plan as we see when he pulls out more strifing powder and ask for water and salt. We do get to learn more about Nolan and Irisa’s early years, which she has mainly forgotten or blocked out. Nolan is again willing to sacrifice himself as he owes Eddie, but he begs Eddie to keep Irisa safe. Of course, we also get to see his impulsive, blood-thirsty side as he doesn’t hesitate in executing Madis himself. I actually really liked Nolan’s simply executing Madis as it adds an extra layer to what life is like in this world, that it hardens even someone who obviously cares about those around him. In fact, it’s a logical reaction if you want to keep innocents safe from madmen and the politicians who would work with them. I thought this week’s episode was pretty solid. It was much more tightly plotted and once again delivered some great performances. The characters continue to grow on my, and that is really what keeps me coming back to a show. What did you think about this week’s episode? Any guesses on what the artifact is? Do you want to see the people of Defiance unite against the outside forces of the E-Republic, or is it more interesting to watch them spar with each other? Anyone else really miss Stahma this episode? Let me know your thoughts in the comments.